The thing is, nobody ever sat down with you and said, “Here’s how many chuggas come before the choo-choo.” (For the record, I say “four.” I am an outlier.) But internally, thanks to a variety of subtle cues, there’s a certain number of chuggas that feels right to you before that oh-so-satisfying “choo choo” comes whistling out. But that’s not the only weird decision you’ve come to! For example, I’m describing a dragon, and I tell you it’s a green young dragon. Wait – that can’t be right. It sounds weird. I mean a young green dragon, certainly. And again, nobody sat down with you to teach you that – I mean, maybe you saw the same viral Tweet I did and learned it, but there weren’t grammar lessons forcing you to list them in the proper order. You just fell into the rhythm of things. The fascinating thing about all of this is that we are awash in firm opinions we didn’t actually realize we had, because nobody challenges them seriously. We’re continually ping-ponged back and forth by ideas that we didn’t generate, and weirdly, we didn’t even realize we’d internalized – they’re just there, so deeply ingrained that we don’t even bother to argue with those ideas, and recoil from anyone who presents an opposing opinion. Yet there’s an equally weird idea many people have that they purposely chose all of their opinions. As though at some point in their childhood, a dark tall Opinion Man came round to their house with a leather large valise full of potential opinions and laid them all out before them – and then the children, using nothing but the power of logic, either accepted or rejected every conclusion they could have possibly come to. He is now on his second or third divorce, I don’t remember which. And his exes will tell you that he doesn’t so much know every element that affects him so much as he constructs a logical justification in retrospect, because he’s utterly terrified of believing that any part of him is not properly vetted by himself. But my point is, none of us are immune to picking up opinions that you didn’t realize you had. It’s kind of frightening to think that something slipped past your conscious thought and became rooted in your expressed behavior – but here you are, wincing when I described a suitcase as a “leather large” valise. So there you are, surrounded by a whirlwind of subliminal opinions that have wormed their way into your judgment. There are things that seem right, and things that seem wrong to you. And they’re generally not so earth-shattering that you will bother to correct someone; they just irritate you, so that you think a little less of someone. And some of those opinions? Are racist. And some of them are sexist. And yes, like my very rational friend, some of the folks reading this will rise up in indignation because I’m not sexist or racist, I don’t know what you’re thinking, I’m a very rational thinker. But there’s a lot of things that do get absorbed into your system, and you might not even be aware of ’em until someone points them out. It’s sort of like the way black kids are more likely to get arrested or shot by cops because at some point an opinion made their way into the cops’ bloodstream that young men with black skin are more threatening than young men with white skin. And I think most of those cops, if they gave an honest answer, would deny the idea that they’re racist. But when they’re chasing after someone, that idea that “black kids mature faster” or “black people feel less pain” triggers, and they act in a way that comes to a racist conclusion even if none of their conscious mindsets went for that at all. Likewise, a lot of people – men and women – would tell you that they’re not sexist. But studies have shown that a group is perceived to be overwhelmingly dominated by women if they’re occupying around 30% of the conversation. And that reaction is probably as subliminal as the leather large valise problem, but it does affect how the conversations happen. And whenever I suggest “Hey, maybe you have some subliminal conclusions that help encourage discrimination,” I get a variant on the “Yes I am very logical” debate, because these people know who they are, it’s ridiculous to suggest they might not have mapped out the entirety of their being, they don’t have a racist bone in their body. But I wonder how many chuggas they need. Again, they probably didn’t map out the number of chuggas – but whenever they’re playing with a kid, there they are, taking a number they did not actually come to a conscious conclusion on and passing it on to another child. If they hang around with that kid long enough, eventually that kid will grow up to be a three-chugga kid because, well, that’s the chuggas in the air and that’s the way chuggas should be. Pretty harmless for a chugga-chugga-chugga-choo-choo. Little more harmful if it’s racism. You’re not an outlier, or else we both are. I am also a 4-chugga human. It may be a Connecticut thing. Everyone has opinions and beliefs that they’ve internalized. I’ve seen many posts in feminist groups where the OP talks shamefully about having a knee jerk reaction to someone who’s overweight, or dressed revealingly. “I don’t want to be that person!” they wail. They are afraid that they can’t change those reactions. The rest of us say, yes you can. It takes time and effort and uncomfortable awareness, but yes you can. That whole 1-chugga thing is just crazy, though. The poll I saw had me in third place. So we may be a generic outlier. And you can change them. But you have to be willing to investigate them. I do the chuggas in sets of 4, emphasis on the first 2 sets, then choo choo. CHUGGA chugga chugga chugga CHUGGA chugga chugga chugga CHOO-oo CHOO. And the first choo is 2 syllables, dropping off in pitch. Anything else is an abomination! I’m 8 chuggas … what does that say about me? Maybe I like a big buildup? Also 4 chuggas. But really, any even number is ok, because they come in pairs: CHUGGA-chugga. I don’t know where you’d put the stress on an odd number of chuggas. Yes, exactly! I could stand 2, but never 3 – & you explained why! This is what bothers me about the whole paradigm of thinking that it’s people who are racist or not racist, sexist or not sexist, etc. It’s more of a continuum, or maybe not even that but a set or cluster of opinions, ideas, etc. I mean, I think it’s still useful to categorize the Grand Poobah of the local KKK as “a racist” in the same way that it’s useful to categorize the Mojave Desert as “hot”–you can do so while still recognizing that temperature is a continuum. Over the years, I’ve found that thinking about it this way makes it easier for me to recognize (and, more importantly, try to counteract) the internalized biases I have. Still gonna die on the hill of what a “bagel” is, though. Part of that is just people like to take things personally (which I don’t get, but is off-topic), but part of it is them hearing it in the context of the general usage. This is also the trap of the “is so-and-so a racist?” question. It’s asked like it’s a binary, yes-or-no question, but in my paradigm it’s far more complicated than that. Aside from agreeing with this post, apparently my brain has decided that you need an even number of chuggas, preferably 2, 4, or 8. 4 is best, and any odd number is right out. The odd people are freaky. There. I said it. Yes, this. 2, 4, or 8 is what my brain prefers too . Puzzled daughter of a railroader who lives near country train tracks.. the whistle blows when the train approaches a crossing! Woowooo! I’m now a little worried. I’m a 12-chugga human . . .
Nah, you just like long trains. Glad you said that. I am definitely also on team 12. Anything less and the pressure built up is insufficient to truly choo-choo. Ain’t nobody got time for 12 chuggas…. There could be a gender-related pattern, in which men tend to require less build-up of chuggas, before a satisfying choo; and some men are more willing than others, to build up enough chuggas not only for their own satisfaction, but also that of others. Six chuggas (and I don’t know why, but that’s the number). Great article about how we are carefully taught, whether we realize it or not. I’ve always said four pairs, or four “CHUGGA-chugga”s. I never really thought about my opinion in this matter but as I do feel genuinely odd if I hear less, I am living illustration of your article. Great stuff, thank you. I actually had to think “chuggas” were a thing. 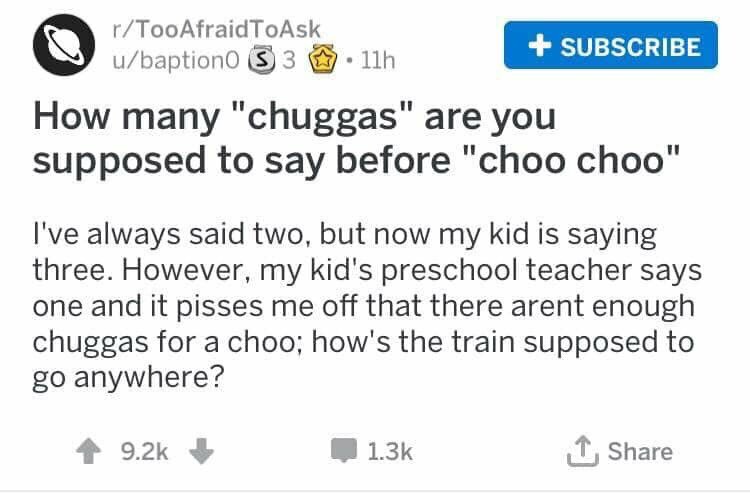 I feel the question should be “How many “Chugga-chuggas” come before choo-choo. The title has Chugga-Chugga. Also a 4 chugga guy along with you and the writer… I am going on the theory that those of us 4+ chugga people intuitively understand that trains take some serious time and effort to get moving. Very thoughtful article. I grew up in a place where four “chuggas” were just right. I also grew up in a poor neighborhood where being “just a little racist” was just right. I am appalled when I catch myself internally saying things my parents or their adult friends would say out loud. I sit myself down and have my own dialogue about how I may have been taught these things through poor examples, but how I don’t need to embrace them. 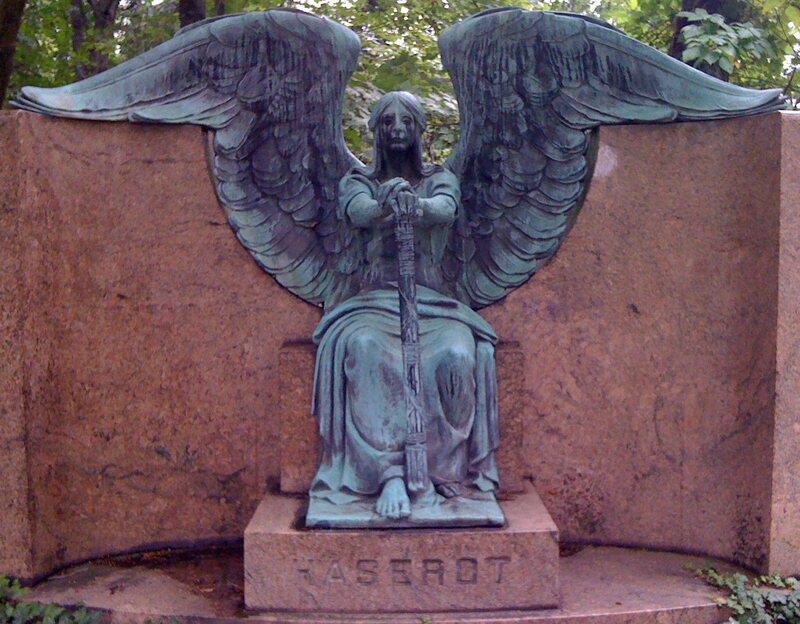 Thank you for the reminder that sometimes, perfectly rational people can do things that were subtly taught to us. It may feel weird knowing there are three and one “chugga” people out there, but I accept their differences and still like them. First of all, I totally agree with what you are saying here. I know I have caught myself in some minor racism and sexism in my own thoughts. I do actively combat them, because I am not a horrible person. But, they are there and do need to be taken into consideration. Second, everyone knows that any even number of chuggas is acceptable. Three chuggas! and a whistle-sounding choo-chooooooooooooooo. I must be even more of an outlier, because I have no idea what this “chugga” business is about. I’m 56 and I’ve never heard of it before. I also accept that I most certainly don’t know the entirety of myself, nor see the same person, in myself, that others see in me. (For a real eye-opener, get to laughing with friends and their children sometime, and ask the kids to do their impressions of you.) I make a conscious effort, most of the time, to try to be aware of what I’m not aware of, and to become more aware of it… if you know what I mean.